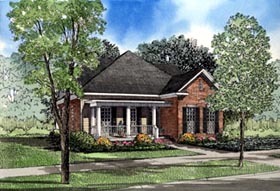 This is a perfect southern traditional home with an eight-foot covered entry porch for relaxing. Entertain friends with lemonade and conversation or move to the rear- grilling porch for an afternoon cookout, enhanced by convenient entry to the breakfast room and kitchen. A great room offers plenty of rainy day entertainment with gas fireplace and built-in media center. Attached is a formal dining area enhanced by eight inch wood columns. Open stairs from the foyer lead you up to the second floor. Eight foot ceilings create a pleasant openness in the upper two bedrooms, complete with walk-through bath.